State police came to the rescue of some stranded horses after a minor fender bender on Route 93 north in Woburn left the animals without wheels. The incident happened at 8:15 Saturday morning when a pickup truck pulling the horses, which were inside a trailer, had a minor crash with two other vehicles near the exit to Route 95 south. Neither human nor horses were injured, police said, but the accident left the equines stranded. Some quick thinking by troopers came up with a solution, according to police. Troopers called in the mounties, well, rather the Mass. State Police mounted unit to assist. The mounted unit sent one of its four large horse trailers, complete with another trooper to "chauffer" the hitchhiking horses to their destination, police said. 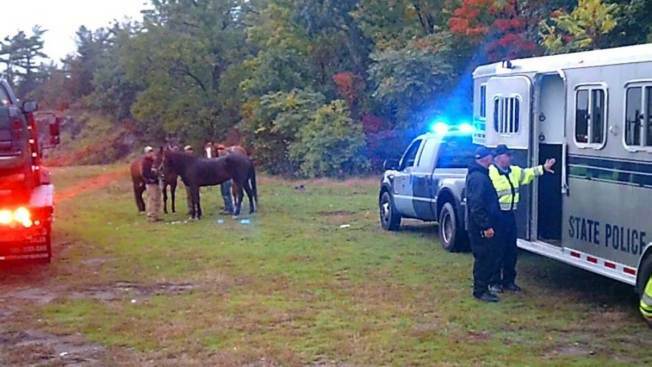 "Troopers and the horses’ handlers began loading them into their temporary ride," State police tweeted. "Not something you see every day when driving down the highway." Police were able to send the horses moseying along and then restored automobile traffic flow by 9 a.m.
"Not your usual type of police ride-along! An eventful morning with a good ending," police added. "We were happy to be able to help."